I was off half a day on last week Wednesday, my better half suggested to have lunch at an Indian shop where there is a stall selling nice banana fritters with cheese (pisang goreng cheese) which he has been telling me many times over..this plate consist of about 6-8 pieces of pisang goreng topped with generous amount of shredded cheese for only RM4.00, I do not fancy fried stuff so I only tasted one piece of the banana fritter since I also had nasi campur.. 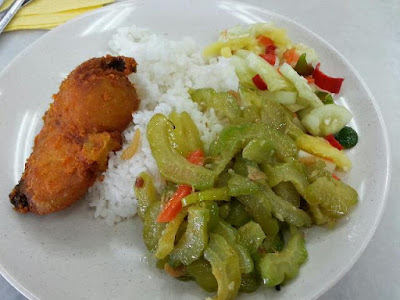 I thought nasi campur would be cheaper, but I was wrong, this plate cost me RM10.00 for 2 types of vegetable and 1 piece of fried fish..Don't you think is over priced ? I paid for it, left the shop then realised I should have asked how much is that piece of fish. 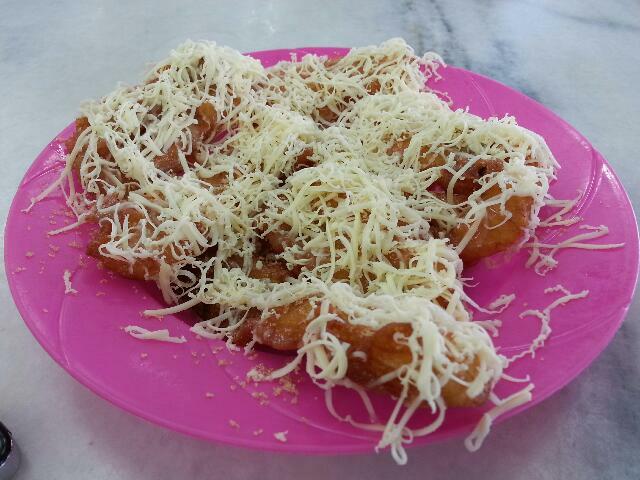 Sad to say, eating in KK has becoming expensive..
Banana fritters with cheese looked so appetizing. Here a piece of fried fish is about RM5. The goreng pisang cheese sounds interesting. Never eaten that before. So creative...goreng pisang cheese. RM10 for that mixed rice is very expensive! Wow! I like the idea of goreng pisang with cheese. We don;t have this variety here so I will buy the goreng pisang and wrap with cheddar cheese slices! I could imagine that it turns out delicious. Yums! The goreng pisang cheese is more worth it than the plate of mixed rice! RM10 is quite high. Unless that fish is a special type. Where is this place, i like banana fitter with cheese. at the Indian Shop in Grace Square, Sembulan.